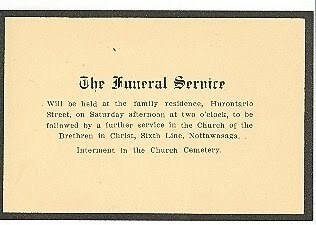 Another Funeral Memorial Card has been rescued. I can't pass these by when I see them in flea markets or antique stores, and my latest find is for the Welsh & Ditson families in Collingwood Ontario. 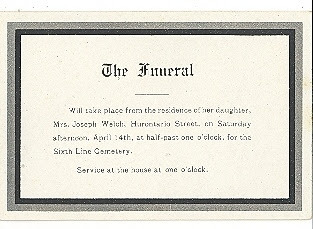 The other side of her card provides the funeral details. The Funeral Service will be held at the family residence, Hurontario Streeet, on Saturday afternoon at two o'clock to be followed by a further service in The Church of the Brethen to Christ, Sixth Lane, Nottawasaga. 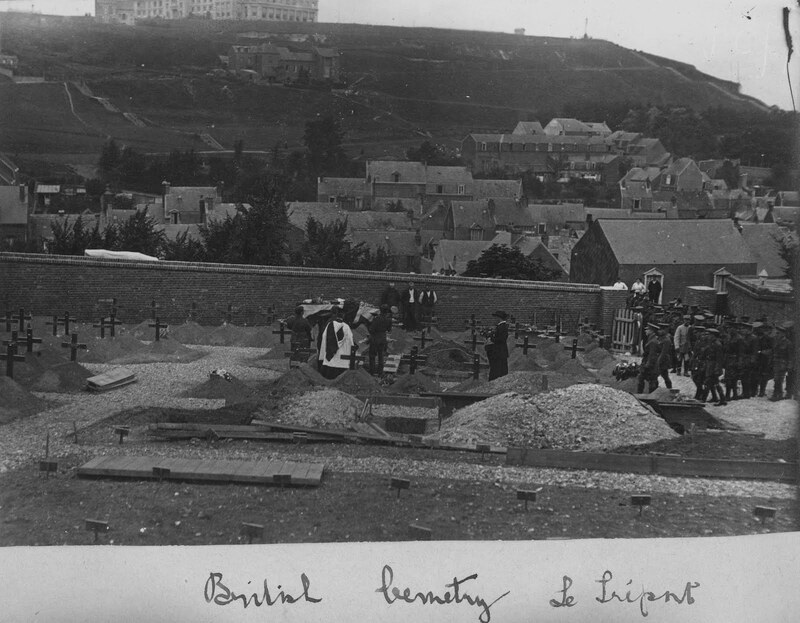 Interment in the Church Cemetery. 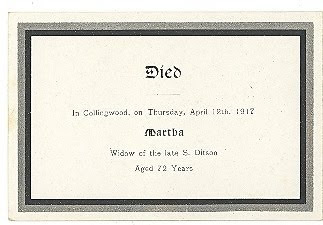 Died in Collingwood on Thursday April 12, 1917, Martha widow of the late S. Ditson, Aged 72 years. Barnardo's Homes took in abandoned and orphaned children in England. Most were cleaned up, fed, clothed and photographed on arrival at Barnardo's. Many were sent to homes in Canada and Australia as little more than indentured servants. Some died in the Home. 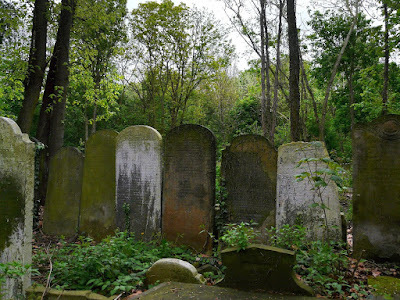 Researchers with Friends of Tower Hamlets Cemetery Park began research into some of the children who died in Barnardo's and were buried in unmarked graves in the London cemetery. in 2016 photos of the children along with their names and details of their short lives were put online. On September 1, 2017, FamilySearch will discontinue its microfilm distribution services. That's right - no more ordering film into a local Family History Center. 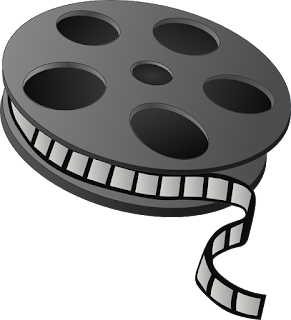 Before readers react in horror, remember that FamilySearch has made good progress (over 1.5 million films done to date!) on digitizing its microfilm collections, and is continuing to digitize them. Once digitized they are put online. There are many genealogists, like me, who have NEVER had access to microfilm loans due to no nearby FHC, nor have we been able to access them in Salt Lake City (due to travel and/or expense). But the world has not ended, and we have been able to make great progress on our genealogy. I'd also like to remind those who think the sky is falling that FamilySearch records are FREE. It surprises me to see complaints about a free service as I am now seeing on Facebook as genealogist are learning of this policy change. We should all be thanking FamilySearch profusely for even creating the microfilms and then working on digitizing them. And I know I'll get some flack for saying this --- but --- as much as I love genealogy, as much as I am absolutely addicted and obsessed with it --- it's not truly that important in the overall scheme of things. Finding a cure for cancer - that's important. Feeding hungry children - that's important. Figuring out how to have peace in the world - that's important. My suggestion is that we all keep it in perspective. Just my personal thoughts on this. Thanks to Gail Dever's article Toronto city directories digitized, 1910 – 1926 I learned that missing city directories for 1910, 1915, 1916, 1920, 1923, 1924, 1925 and 1926 have been digitized and are now searchable online. 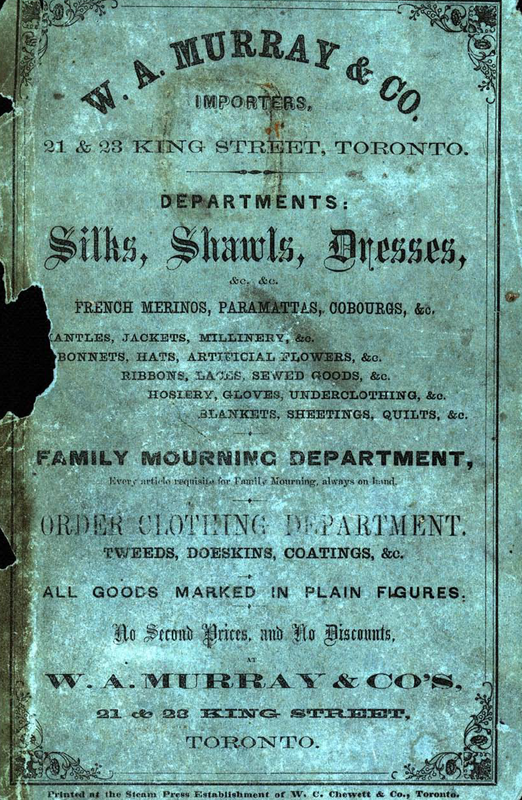 The first Toronto directory was published in 1833. Most directories contain an alphabetical list of inhabitants (usually heads of households and others working outside the home), and a list of occupants arranged by street. 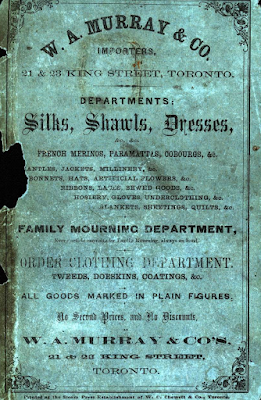 Genealogists with Toronto-based ancestors won't want to miss this set of city directories. 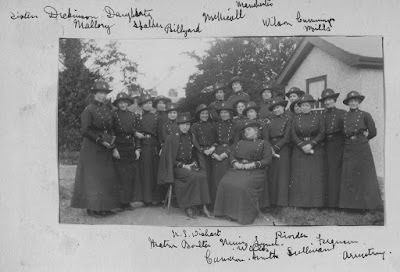 "Sisters Dickinson Doughtery Mallory Spalker Billyard McNicoll Manchester Wilson Cummings Mills"
Thanks to Sassy Jane Genealogy, I found out about a very nice database. The Watson House Digital Archives has information on Irish immigrant girls who arrived in New York. The collection includes fully searchable records of the Irish Mission at Watson House 1883-1954. No. 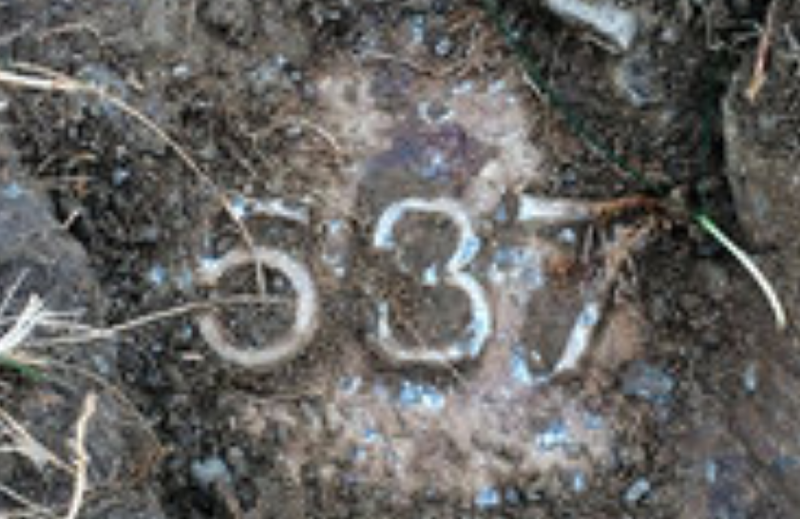 537 grave marker in a potter’s field in Middletown, New York have held unidentified remains for 47 years. An article by Michael Wilson, states "A murdered drug dealer dressed as a man, had lovers of different genders and used several aliases, successfully concealing her identity even well past her death." Who was the victim and how was her identity revealed? Her burial took place November 7, 1970, her body having been found two weeks earlier. She had no ID and was buried as an unknown person. Many years later, her fingerprints were run through a new database and were matched to a woman arrested several times in the 1960s in Harlem. 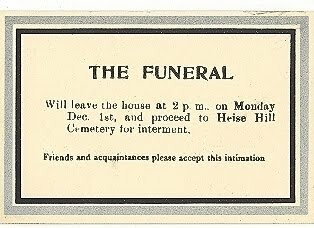 This is another rescued Funeral Card. Louis Burmister was a young man with his whole life ahead of him when he died in 1886. 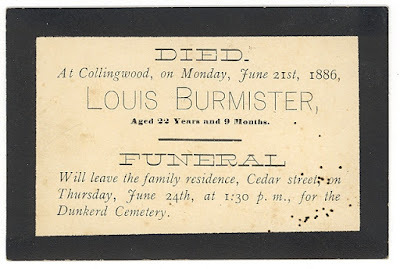 Died at Collingwood on Monday June 21st, 1886, Louis Burmister, aged 22 years and 9 months. Funeral will leave the family residence, Cedar Street on Thursday June 24th at 1:30 p.m for the Dunkerd Cemetery. After rescuing this card from a flea market I wanted to give Louis a voice. I began my search at Ancestry. 9 year old Lewis (sic) is found in the 1871 census for Puslinch Township Wellington County Ontario with his rather large family of parents Ludwig (54) and Fredericka (33) and his 5 siblings ages 2 to 13. Anyone interested in having this Funeral Card can contact me by leaving a comment on this blog post. Be sure to provide your email address. Page 14 of the Flynn family photo album contains three badly faded photos. A medieval cave has recently been discovered beneath a farmer's field in Shropshire. Apparently the cave was used by a religious order that fought in the Crusades. 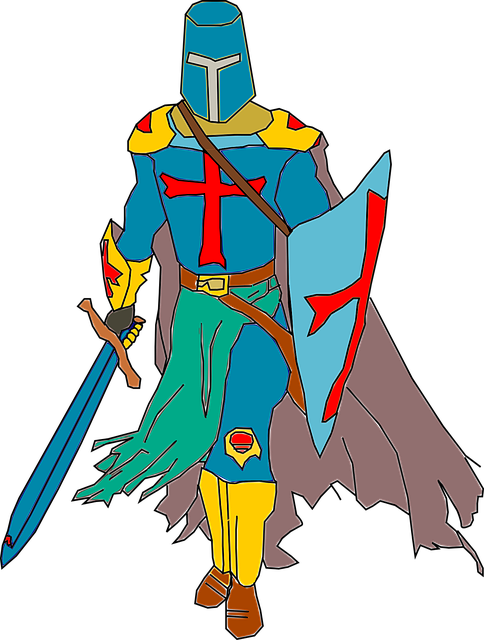 The Knights Templar would have used this cave and walked its labrynthe of corridors in the 13th Century. One of my ancestors, the Dutchman Jan Damen, was part of the Crusades and he is in a painting by Jan van Scorel circa 1541. Good news for anyone who has an ancestor who fought in the Fenian Raids. Ancestry has brought the records for Fenian Raids Bounty Applications, 1866-1871 online. This database consists of bounty applications for veterans having served during the Fenian Raids of 1866 to 1871 in Canada. Between 1866 and 1871, the Fenian Brotherhood, Irish nationalists based in the United States, launched raids against Canada in an effort to force the British government to withdraw from Ireland. The raids took place at Campobello Island, New Brunswick; Ridgeway, Ontario; along the Quebec/US border at Eccles Hill and Huntingdon; and in 1871, an attempt was made to invade the province of Manitoba. To combat the Fenian threat, the Canadian Militia in both Ontario and Quebec was called out on several occasions, often for only a few days at a time. The Fenian scare was so widespread in British North America that the Nova Scotia Militia was also called out from time to time, although no raid took place in the colony. Decades later, the federal government decided that all those who participated in the defence of Canada during the Fenian raids (and who were still living) would be provided a grant or bounty of $100 upon application under the terms of the Fenian Raid Volunteer Bounty Act (1912). 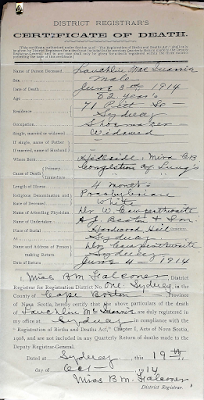 This database consists of lists of names, applications (2 sided), both allowed and disallowed, for the bounty as well as some records relating to pensions for those who were wounded, taken ill or killed while on active duty. 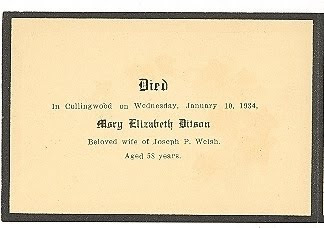 Funeral and Memorial Cards are valuable tools for genealogists. Often overlooked as a resource, they can provide invaluable genealogical information. My husband and I try to rescue these cards whenever we find them at flea markets and antique stores. For me the joy is researching the individual and giving them a voice. 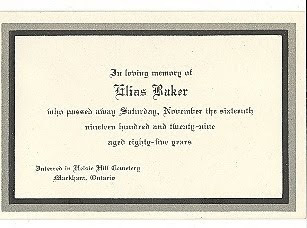 Here is a wonderful find - the Memorial Cards for Elias Baker and his wife Elizabeth. 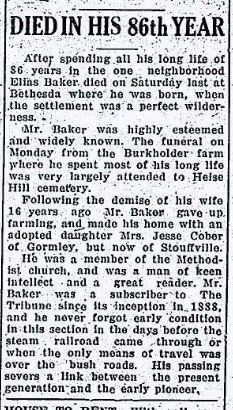 In loving memory of Elias Baker who passed away Saturday, November the sixteenth nineteen hundred and twenty-nine aged eighty-four years. Intered in Heise Hill Cemetery, Markham, Ontario. The left side of the interior of Elias' Memorial card is a traditional verse. His obituary appeared in the Stouffville Tribune in November. The mention of the Burkholder farm was intriguing to me as I am a Burkholder descendant. 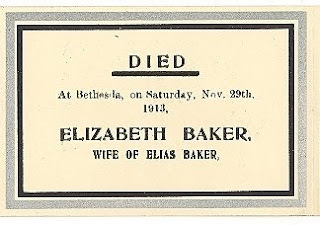 Elias' wife Elizabeth's Memorial Card indicates that she died in 1913. Her card reads "Died at Betheseda, on Saturday Nov. 29th 1913, Elizabeth Baker wife of Elias Baker"
We are happy to pass these cards on to family members. Please leave a comment here on this blog post with your email address, or write me directly at olivetreegenealogy AT gmail.com Be sure to visit AncestorsAtRest.com for more Funeral Cards and Memorial Cards. This page of the Flynn photo album has photos that look like they were taken at 51 Robert St but there is no labelling visible. Excited to see my "Expert's Choice" tip published in Who Do You Think You Are? Magazine. Who Do You Think You Are? Magazine accompanies the BBC series and provides expert family history advice. Follow me on Twitter @LorineMS! Labels: Canadian Genealogy, Olive Tree Genealogy, Published Article, Tips, WDYTYA, Who Do You Think You Are? Little Helen Hootman did not live long. She didn't make it to 5 months of life, dying on October 11, 1907 at her home. This is Helen's funeral card on the left. 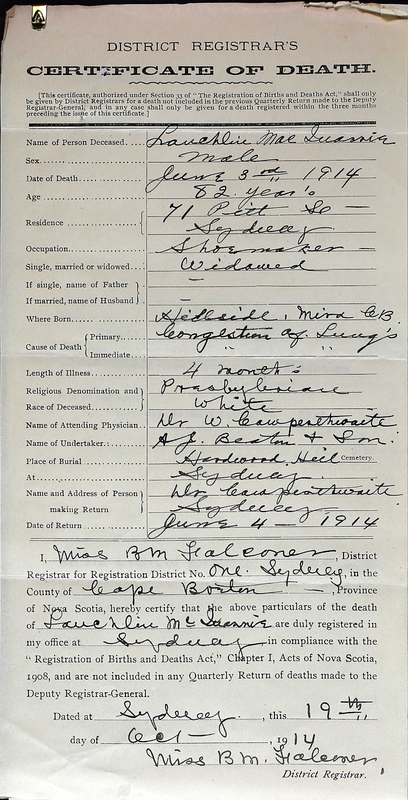 Her parents' names are given only as Mr. & Mrs. S. T. Hootman, her funeral service was held at home and her burial took place in Maple Hill Cemetery. The 12th page of the Flynn family photo album has no writing. Olive Tree Genealogy has been online since February 1996 and in those 20 plus years, I've published many free genealogy records for visitors to use. The Baptismal Register 1756-1822 from THE OLD DUTCH CHURCH AT TOTOWA New Jersey is just one of many free databases that can be found on my site. 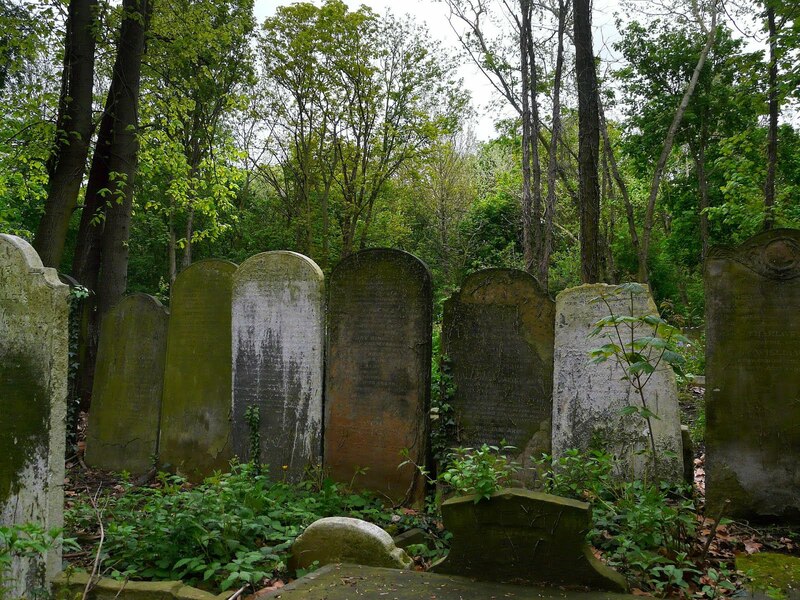 If you have ancestors in New Jersey in this time period, please enjoy looking through the free records on Olive Tree Genealogy. For other New Jersey records see my New Jersey section.